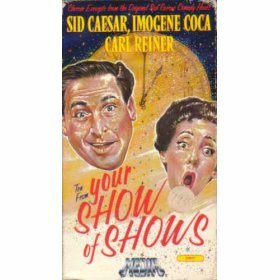 Television show starring Sid Caesar, Imogene Coca, Carl Reiner and Howard Morris; created by Sylvester L. Weaver Jr.
No one casts as long a shadow over my sense of humor as Sid Caesar. As an icon of everything that great comedy could be, Caesar and his writers and fellow cast members reached a pinnacle that influenced everything that came afterward. No part of my life overlapped his heyday, so I have to admit that I struggle to understand how I even knew he existed, but Caesar always seemed to be there in my head. After we moved to Ohio, we drove back to northern New Jersey frequently throughout my formative years. This was before cable, when our region had maybe one independent channel. Visits to the New York City broadcast area provided a panoply of viewing options. Stations there treated Lucille Ball, Jackie Gleason and Sid Caesar like going concerns long after network television had banished them. My grandparents had a tiny TV set against one wall, which was never turned on until all the guests had exhausted all possible conversational subjects. More often than not, this took two or three days. Occasionally, my grandmother would take pity on a bored (so bored) grandchild and see if there was anything to watch. I discovered The Honeymooners (which confused me), I Love Lucy (which was wonderfully insane) and Your Show of Shows (or possibly Caesar’s Hour) in reruns. I was pretty young when it became a tradition, but my brother and I started watching It’s a Mad Mad Mad Mad World before I entirely understood what I was seeing. Network television rebroadcast it every year for awhile, so we just had to tune in. Then, I kept watching it. At first, I thought Jonathan Winters was the best thing about the movie, but that evolved. I can’t say that Caesar ever became the focus for me, but I do relate to his character in some ways now. The reality is that Caesar had pretty well disappeared from contemporary view when I was pretty young. He wrote two autobiographies that document his downfall due to addiction as well as his subsequent recovery. Much of what I saw, therefore, were cameos and tributes. The advent of self-selected viewing made some of his original work available, though too much has been lost. I have sought out as much as possible and it is truly revelatory. Perhaps his incredible stable of writers is responsible, but every bit of humor and timing that I know originates there. I suppose it’s nice to be able to blame someone else for a silly streak. We all live somewhere in the middle of a long line of influence that stretches behind and before us well out of sight. Whatever we do with our moments, our choices bear the marks of those who shared outside of our view. It is a striking notion to realize that the ignorant youth who claims no knowledge of this or that great predecessor still could not have happened without her or his forebears. You’ve Got to Check This Out is a blog series about music, words, and all sorts of artistic matters. It started with an explanation. 18 more to go.